Tampa, FL – As a web design firm, we obviously meet with a lot of people who have a lot of questions about how to plan, develop and implement their new web site. Although every site is different, and we wholeheartedly believe in building custom web sites, every site should contain a few key elements. In today’s blog post, I am going to cover the basic outline of what information and elements should be on your home page. Your home page is IMPORTANT.. extremely important. It’s your first (and many times only) chance to capture a user’s attention enough to read more and spend some time browsing your site. After all, you don’t want to think you have wasted all those hours of content writing for the interior pages only to lose your audience on your home page. With only a small amount of room to work with on your home page, How do you divide up the real estate to get your information across and reduce bounce rate? Below, I’ve mocked up a web site with these elements outlined so you can see where and how we implement them into site design. Usually, a customer will look to the top of your site for your Company Contact Information. Most often, this comes in the form of a branded logo and telephone number and/or email address. My advice, if they are looking for it in this spot, put it there. You never want to hid your contact information. And… if a customer is logging on to your web site to contact you, make it as EASY as possible. In short, this is where your buttons go. These are more than buttons though, these are in essence, your first calls to action to get browsers around your site. Your buttons should be short (not wordy), concise and to the point. When a customer reads what the button says, they should understand exactly what it takes them to. If a customer knows what they are looking for, your buttons should lead them to the page they need to view without any guessing. In most sites we build, this section slides through a few different images to highlight the most important products or services highlighted on the web site. These sliders should contain the most important things you would tell a potential customer about your company or products. It’s estimated that you have about 15 seconds to gain a customers attention before they leave your site. This is the section where you do it. This section is close to the top of the page so it will show fully on their computer screen. You should use short, powerful sentences or bullets. Since this section is animated, you want to make it easy to read and incorporate an aestetically pleasing element to draw your audience in. There should also be a call to action like “Learn More” or “Click here” to drive traffic to the corresponding page. This section should be a keyword rich summary of your company. It shouldn’t be longer than a few paragraphs, so only summarize the most important aspects of your company and don’t forget to pepper in a few high quality keywords. These keywords are for SEO. They should be what you think people will type in to find your company. I am not saying that by adding keywords you will automatically be found in Organic Search Results, but it will help. Oh, the sidebar. How easily this portion of the site is thrown together last minute or let fall to the wayside. Sidebars are actually extremely important. Aside from your slider, your sidebar will contain your secondary breadcrumbs and calls to action. It should almost always contain a contact button and a newsfeed if you have one. The newsfeed is great for SEO because it consistently updates the home page with new text for web robots to return to and consider important. 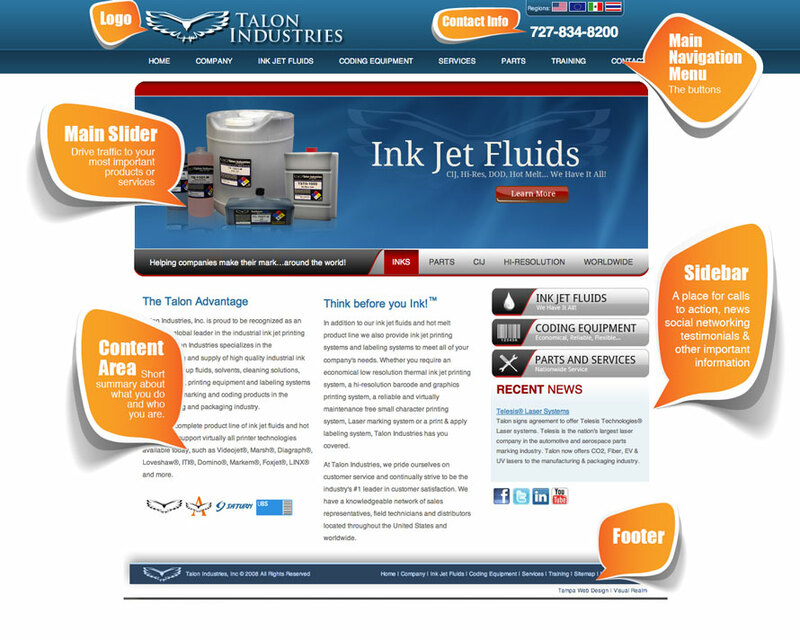 Other ideas for the sidebar are calls to action that drive traffic to specific pages on the site, Marketing Language to announce sales, promotions and giveaways, testimonials that give your company legitimacy and bring the audience in on a more personal level, or Social Networking Icons, Fan Box, or Announcements. The bottom of your web site should contain a footer. The object of the footer is to re-outline your buttons and site structure, provide company information (address, contact, copyright) and complete the overall look of the site. Recently, we’ve seen a push toward larger footers that link to more pages within the site and include more graphic icons and information. Although we agree that every site is created differently and the format displayed above will change from site to site, the key aspects discussed in this post should always be considered when formulating a home page. In another recent blog post, I discuss how to write content for your site (click here to read more) which also contains questions to ask yourself about what to put into your main slider and sidebars.